Could Kudos – an Instagram for kids – be the key to grown-up social media? Social media has a maturity problem. Twitter and Facebook are both beset by antisocial behavior, and although CEOs Jack Dorsey and Mark Zuckerberg have pledged to clean up their respective sites, they've failed to find a suitable mop. Much like Instagram, Kudos is a social media platform centered around sharing and commenting on photos, but with one important difference: it's specifically designed for kids age eight and up, with the belief that the right introduction now can help them behave like adults later. "Our mission is to begin to civilize online discussion, so that people behave in the digital world more respectfully, and are more respectful of each other," says Pam Kerwin, head of product at Kudos, in an interview with TechRadar. Sites like Instagram, Facebook and Snapchat have an age limit of 13, but younger children will inevitably sign up to share pictures and chat with their friends. "There’s no avoiding that," says Kerwin. "It’s our responsibility to provide an alternative, and we think that if we introduce it gradually with adult oversight then they will become more adult users of social media." 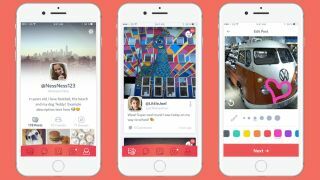 Kudos is far from dumbed-down, though – it looks just as smart as Instagram itself and has almost all the features you'd find in a grown-up app. "We’re trying to make the experience as authentic as we can," Kerwin says. "Unless you let the kids have a similar experience then they won’t use it." For example, kids can share a picture with all their friends, or with everyone in a special interest group, but there's no way to send a photo or a comment to a single person. "That means there’s none of the cliquey behavior you get with Snapchat. If you want to share it with your friends, you share it with all of them. There’s a positive sharing rather than anything that could hurt anyone’s feelings. "We’ve also deliberately avoided popularity contests. We don’t do any rewards for random collections of friends or likes. We don’t want kids to define themselves by collecting meaningless stats." Norwegian entrepreneur Ole Vidar Hestaas founded Kudos in 2014, inspired by his eight-year-old son, who had seen his three older sisters using social media and wanted to join in. "There was a very good reception, and Ole decided to expand to the US," says Kerwin. "We redid the interface because kids in the US are a bit more sophisticated and jaded, and released it about a year ago. This summer we’re going to add new features like support for video, filters and stickers. Those features are coming along nicely. Making a social platform for kids poses special challenges – particularly when it comes to safety. For Kudos, it's all about making sure parents are in control. "Kids can join a group, but they can’t post pictures or comments without their parents' permission," says Kerwin. "We send an email to their parents asking them for approval, and disclosing all the information we collect – and we don’t share it with anyone. "Then we put parents through a third-party verification step, and they have to present a form of ID like a credit card number or social security number." Once their parent or guardian has been verified, kids can start using the app – though their caretaker will be notified of every picture they post and comment they make. That human touch is important. Kudos uses the Google Vision API to detect potentially inappropriate content in photos, and has a blacklist of banned words for comments, but there's also a team of conscientious moderators who check every picture and comment. Kerwin says there'll be nothing like the notorious case of YouTube celebrity Logan Paul, who shared a graphic video recorded in Japan's infamous Aokigahara forest with millions of young viewers before it was pulled. "No child should see that, even once," she says. Kudos was initially open to kids worldwide, but the team are currently focusing on the US. Once new features including stickers and video support have been added, they're planning to expand again. Kudos is also investigating the possibility of a parallel app for older children. "When a kid is 13, that doesn’t necessarily mean they’re ready for social media." says Kerwin. "In fact, teenagers are very susceptible to peer pressure, and are at high risk on social media." It's a good idea, and with teens leaving Facebook in droves and seeking their own social spaces, this could be the perfect time for Kudos to graduate.